“admirable coherence, a whole warm, rich and very charming sound” [Journal of Music]. Musicians who added a significant contribution to his artistic development are Angelo Clemente, Romeo Tudorache and Karl Leister. His artistic collaboration with Karl Leister, Fabio Bidini, Yuri Gandelsman, Paolo Pollastri, Francesco Pomarico, Ovidiu Balan, Riccardo Ceni, Ivano Battiston, Fabio Di Cásola, Victoria Soames Samek, Aurelian Octav Popa, Mark Clinton, Karen Becker, Angelo Inglese, Landon Baumgard, Patrick Messina, Enesco Quartet (Paris) and Giuliano Mazzoccante, with which it forms a stable DUO, is remarkable. Winner of over thirty prizes in important national and international soloist and chamber music competitions. As an artist, he has performed in concerts held in Europe, Far East and USA. As a soloist, he has collaborated with various orchestras among which the Orchestra Sinfonica della Provincia di Bari (Italy), the Kiev RTV Festival Orchestra, the Philharmonic Orchestra “George Enescu” of Bucarest, the Orchestra Internazionale d’Italia, the Orchestra Milano Classica, the Orchestra of the Bologna Theater, the Orquesta Sinfónica de Venezuela (Caracas) and the Mersin Opera and Ballet State Orchestra (Turkey). He inaugurated with a Recital the prestigious 39th international convention « ClarinetFest ® » in the Lied Center for the Performing Arts in Lincoln, Nebraska USA and was member of the jury ICA Young Artist Competition and I.C.A. High School Solo Competition. Many composers have dedicated him works of chamber music and soloist (Angelo Inglese, Luigi Giachino, Fabrizio Festa and Sergio Calligaris). Tinelli has recorded for the National Radio of Bucarest (Romania), RAI (Italy), Deutsche Südwestfunk (Germany), TVR 1 Bucarest (Romania), TV Dubai (U.A.E. ), News 24 (Albania), Venezuela TV and some CD with first world recordings released by Iktius, Dad Records, VDM Records/RAI Trade, Phoenix Classics dedicated to Saverio Mercadante, Sergio Calligaris, Raffaele Gervasio and Johannes Brahms awarded, this one, by the record critics. Camerata Tokyo (Japan) has released a CD in trio with Karl Leister and Giuliano Mazzoccante (piano) that has been praised by the international critics. Moreover, Farelive (Italy) has released two CD’s with Tinelli, one as conductor of the Italian Red Cross Military Band (C.M.M.) awarded to Global Music Awards 2016 with two silver medals and with four stars on the italian CD magazine Musica and one as conductor and soloist of the Méditerranée Clarinet Ensemble awarded to Global Music Awards 2017 with three silver medals and with five stars on the italian CD magazine Musica. All recordings are available on major digital networks (Spotify, Amazon Mp3, Google Play, iTunes e Deezer). 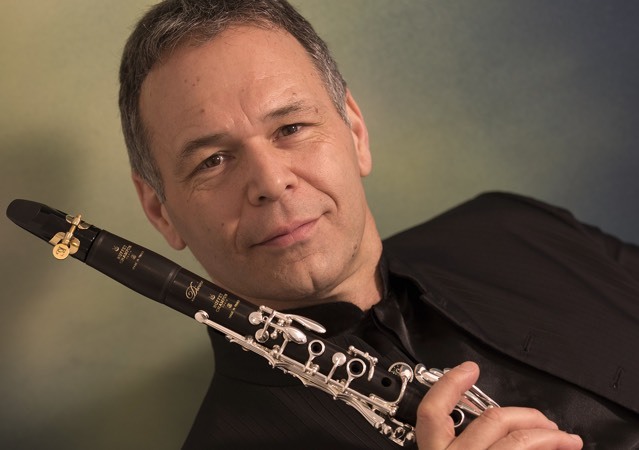 He’s currently Professor of Clarinet at Music Conservatory « N. Piccinni » of Bari (Italy). He also holds numerous master classes in Europe (Oulu University – Finland, Iasi Art University “G. Enescu” – Romania, Tirane Art University – Albania…) and USA (California State University, Northridge). He is additionally the Artistic Director of various musical organizations like the International Clarinet Competition “Saverio Mercadante”. Antonio Tinelli is an official Buffet-Crampon testimonial and D’Addario Woodwind International Artist.